Smooth as the BABY's bottom and it hits like a bolt out of the BLUE. You just have to love the charming, independent, and rebellious spirit of Texas. Balcones Distilling is based in Waco — just about halfway between Dallas and Austin. Texas is a big state, and they like everything big… big steaks, big trucks, big hats, and big flavors. Balcones is still a small distillery, but it is filled with big ideas. They hand-make a range of Whiskeys, Rums, and a few mysterious fiddly things, all of which are unabashedly crafted with the BIG flavors they love. But just because these Texas spirits stand up and yell “Yee-Haw!” doesn’t mean that they don’t have the serious craftsmanship and quality you get in the big fancy capitals of the world. These spirits are top notch, and they carry multiple awards to prove it. Balcones Distillery keeps on cranking out some of the coolest new products with a healthy dose of Texas independence and good ‘ol American tryhard spirit. Their Baby Blue Corn Whiskey is another shining example. Turns out, roasted blue corn makes GREAT Whiskey with a buttery, nutty texture. And the critics LOVE the stuff! It’s a Texas Whiskey rock star — awards everywhere, ovation from fans, groupies in the backstage and the volume cranked up to 11. Rock on! 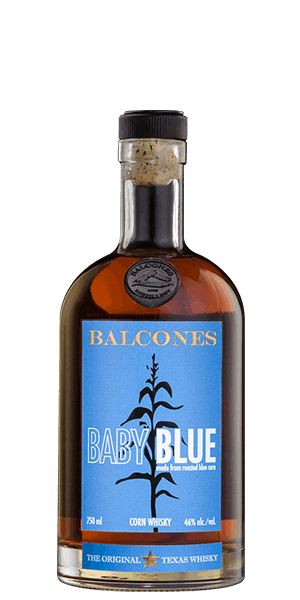 What does Balcones Baby Blue Corn Whiskey taste like? The Flavor Spiral™ shows the most common flavors that you'll taste in Balcones Baby Blue Corn Whiskey and gives you a chance to have a taste of it before actually tasting it. Bourbon set of rules refer to manufacturing method rather than location. It must be matured in new and charred casks of American white oak. No colouring or flavouring of any type is allowed. It must be matured for at least 2 years, if a bottle does not bear an age it is at least 4 years old. The mash bill must contain at least 51% corn. Cracker Jacks, melted butter, nutmeg, and raw chocolate. Exotic fruits, spun butter-toffee, and Ancho Chipotle peppers. Long and mellow, with cedarwood, leather, and bell peppers. Butter, roasted, nutty, dark chocolate, nutmeg, cedarwood, leather, slightly sweet, caramel. This is a different taste. You can smell the corn and it's a bit rough on the tip of your tongue during the first sip. But, it finishes very smoothly. If you're looking for something different outside of your normal bourbon, this will do it. I love this whiskey! Heath Bars without the chocolate...butter toffee. A fantastic initial bloom on the tongue and in the nose. Finishes smooth with that warming glow down your throat. Being a traditionalist, I love that they went the extra mile to make this heirloom with a local varietal corn you don't see much of anymore. Wonderful effort. Mmm. Dark butter toffee, Cracker Jack. Corn sweetness, tons of flavor but easy to drink. After some spicy ryes, this is almost like a dessert treat. thi is as close to real corn moonshine in taste that i can think of. very smoky yet smooth. I can't believe it's not butter! Fabio and Aunt Jemima's liquid love child. The scent of butter was almost off-putting at first. Solid caramel corn sweetness and spice follows once your nose acclimates. Flavor is a shot of movie theater butter, whilst you chew your popcorn blended with candy corn and Milk Duds. Letting it rest brings out the little bit of spice while adding a small drop of water as well. May not be my favorite thing to drink, but something to try regardless due to the pure "interestingness" of it. Sweet and flavorful. The corn is strong up front; there is no doubt this is a pure core whiskey. For those wanting to try to pick out the various grains in a whiskey, this is a great example of what corn should taste like. Clean sweet smell. Smooth with a nice burn. Not really my cup tea a little sweet for me. I was first a little offput by the nose (smells very syrupy). It was just so unexpectedly different from anything I had ever tasted. But this one definitely grows on you, and you start to appreciate all of its unique qualities. Cotton candy, butterscotch, and toffee. Extreme corn at its finest. I am now quite interested to try the Balcones True Blue Cask Strength version. over the top corn flavor with a buttery finish. i will re-stock this bottle. This is a very good tasting whiskey. A little sweet, slight buttery taste. I enjoyed this and will buy it again. Good, but definitely different. My first taste of Corn Whiskey and the flavor is much different than I was expecting. Strong notes of Vanilla and Corn, creating what I translate as a strong corn syrup taste to the whiskey. Every sip lets you know its corn whiskey. It taste good, but a little too sweet and off base for me. I visited this distillery in Waco while on vacation for the thanksgiving this year. A wonderful experience and a wonderful whiskey. Super smooth with a no e finish. I was also able to get my hands on a bottle of what is named True Blue cask strength. These folks are not fooling around. The cask strength is a 68.3abv and grabs your tongue and takes it on a ride like you have never been on before. I love this whiskey and I love this brand. Interesting chocolate note toward the middle of the flavor profile. Great dram. Smokey flavor akin to a nice peated Scotch. Nice corn sweetness, but otherwise a good smokey dram. Would grab another bottle. Upon first noticing the aroma I was not sure but after a couple of sips I was sold. This has become my favorite cocktail whiskey. This is a interesting sipper that has pleasant (Sweet) moments. Best corn whiskey ever (although corn whiskey is normally not my first choice). Smooth and slightly sweet, this ain't your grandpa's moonshine! This is definitely a young whisky with a bite, but a lot of flavor behind it. You can taste the roasted blue corn which gives the brew it slightly distinct edge from other corn whiskies I've tried. Yes, it's young, but it is very drinkable. A nice change when you're just not in the mood (hey, it happens) for that smokey single malt. Give a try while you can get it.